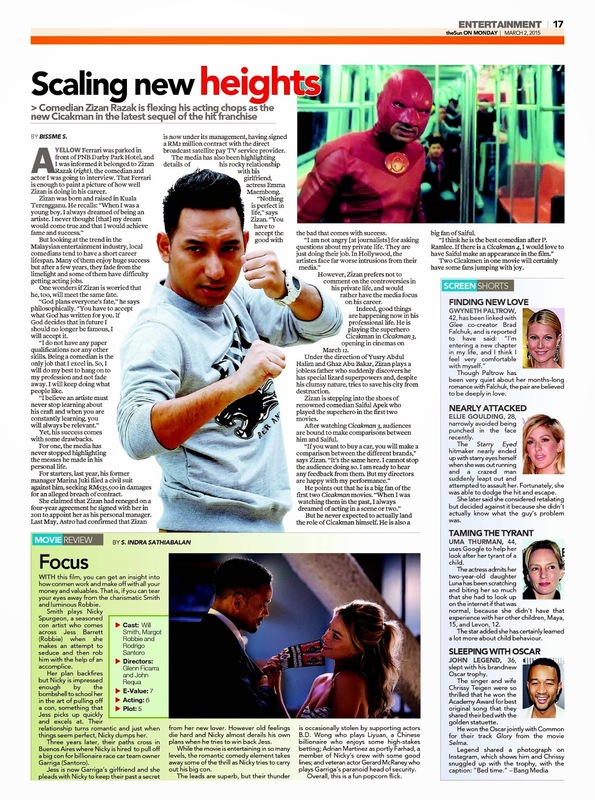 Today, theSun published my interview with Zizan Razak, one of the hottest comedian in Malaysian entertainment scene. Below is the full story. A yellow Ferrari was parked in front of PNB Darby Park Hotel and I was informed it belonged to Zizan Razak (right), the comedian and actor I was going to interview. That Ferrari is enough to paint a picture of how well Zizan is doing in his career. But looking at the trend in the Malaysian entertainment industry, local comedians tend to have a short career lifespan. Many of them enjoy huge success but after a few years, they fade from the limelight and some of them have difficulty getting acting jobs. One wonders if Zizan is worried that he, too, will meet the same fate. only job that I excel in. So, I will do my best to hang on to my profession and not fade away. I will keep doing what people like. Yet, his success comes with some drawbacks. For one, the media has never stopped highlighting the messes he made in his personal life. For starters, last year, his former manager Marina Juki filed a civil suit against him, seeking RM535,500 in damages for an alleged breach of contract. She claimed that Zizan had reneged on a four-year agreement he signed with her in 2011 to appoint her as his personal manager. Last May, Astro had confirmed that Zizan is now under its management, having signed a RM2 million contract with the direct broadcast satellite pay TV service provider. The media has also been highlighting details of his rocky relationship with his girlfriend, actress Emma Maembong. “Nothing is perfect in life,” says Zizan. “You have to accept the good with the bad that comes with success.I am not angry at journalists for asking questions about my private life. They are just doing their job. However, Zizan prefers not to comment on the controversies in his private life, and would rather have the media focus on his career. Indeed, good things are happening now in his professional life. He is playing the superhero Cicakman in Cicakman 3, opening in cinemas on March 12. Under the direction of Yusry Abdul Halim and Ghaz Abu Bakar, Zizan plays a jobless father who suddenly discovers he has special lizard superpowers and, despite his clumsy nature, tries to save his city from destruction. Zizan is stepping into the shoes of renowned comedian Saiful Apek who played the superhero in the first two movies. After watching Cicakman 3, audiences are bound to make comparisons between him and Saiful. “If you want to buy a car, you will make a comparison between the different brands,” says Zizan. He points out that he is a big fan of the first two Cicakman movies. But he never expected to actually land the role of Cicakman himself. He is also a big fan of Saiful.